Senate Majority Leader (for now) Harry Reid (D., Nev.) has led a rambling crusade against right-leaning philanthropy barons Charles and David Koch. Over the last several months, Reid has called the Koch brothers "un-American" and suggested they were the "main cause" of climate change, among many other incoherent tirades. Democrats running in close races across the country have followed suit, and tried to attack their Republican opponents by linking them to the Kochs. The latest NBC News/Wall Street Journal poll suggests that Reid's efforts haven't panned out like he might have hoped. Only 27 percent of voters have a negative view of the charity givers, while 47 percent don’t know who they are. Those number haven't moved significantly since a similar poll taken back in April. Reid, meanwhile, is far less popular. Nearly 40 percent of voters have a negative view of the senator. 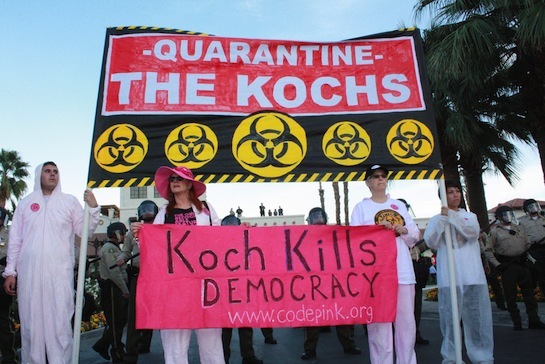 Reid has often ranted about the Koch brothers' evil plan to "buy our democracy." But as it turns out, the single largest donor—by far—to outside spending groups this cycle is Reid’s good friend Tom Steyer, an environmentalist billionaire. This entry was posted in Politics and tagged 2014 Election, Democratic Party, Harry Reid, Koch Brothers, Senate. Bookmark the permalink.